DARWIN, Australia, May 29 2013 (IPS) - This city in northern Australia brought them together to share their experiences this week. They are indigenous Shipiba people fighting indiscriminate logging in Peru’s Amazon jungle region and delegates from the Ando-Kpomey community in Togo, which created and protects a 100-hectare forest. 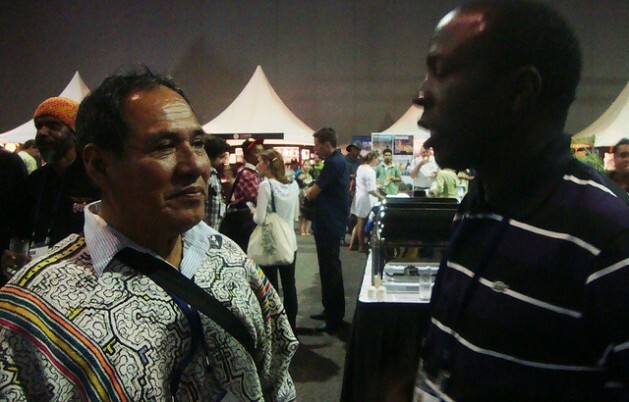 “Without the forest we are nothing – it’s like losing life itself,” said Juan Chávez, a Shipibo Indian from the eastern Peruvian region of Ucayali, in a conversation with IPS during a break in his participation in the World Indigenous Network (WIN) conference that ended Wednesday in Darwin, Australia. Chávez and others have been working for 15 years to keep six Shipibo communities from being seduced by illegal logging for a quick profit, and to help restore the indigenous group’s tradition of forest preservation. To that end, they designed communal development plans, based on reviving traditional knowledge on management of land, water and forest resources, with the support of the Association for Integral Research and Development (AIDER), a Peruvian NGO. The 1,200 indigenous representatives from some 50 countries focused their attention Tuesday, the third day of the four-day WIN conference, on successful cases of reviving ancestral and traditional cultures and knowledge, under the premise that “sustainable development not only depends on modernity; it’s also important to look to our roots,” as Chávez put it. Some of the cases, like the Shipibo experience presented by Chávez, have won prizes from the Equator Initiative, which brings together the United Nations, governments, civil society, businesses and grassroots organisations to acknowledge and foment local sustainable development solutions. “We are not poor devils; we also come up with solutions,” Ecuadorean indigenous leader Manuel Tacuis said in his presentation at one of the WIN sessions. The delegation from Ecuador was the largest from Latin America, along with Brazil’s. As the representatives of indigenous and local communities from around the world exchanged experiences, it became more and more clear that the everyday lives and the challenges faced by people in rural Africa were not so different from those of native people in the Amazon rainforest. The community of Ando-Kpomey in the West African nation of Togo began over a decade ago to restore the forest on their land, which had been destroyed by the seasonal burning of grasslands by hunters. Koku Agbee Koto, an avid 35-year-old representative of the community, told IPS that the destructive practice had finally been significantly reduced. So far, more than 100 hectares have been reforested, benefiting around 2,500 villagers, he said. But the Togolese and Peruvian representatives concurred that traditional knowledge was no longer sufficient to sustainably mange land and adapt to climate change. “We have to appreciate both cultures: indigenous and scientific,” said Chávez, after admitting that there was still resistance among his people to recognising what science could contribute. The indigenous and community delegates taking part in the WIN conference demonstrated their openness. Koto, from Togo, constantly took notes on the different experiences shared by indigenous and local people from around the world, used his limited English to ask for more information, telephone numbers and email addresses, spoke “un poquito de español” with Chávez, while chatting easily in French when meeting with delegates from other French-speaking countries in Africa. Madagascar, which he felt could be replicated in his village. The Anja Reserve community-managed forest and ecotourism site, another Equator Prize-winner, generates income for the elderly, children and vulnerable segments of the community, who are assisted with basic services and scholarships, while restoring the forest and curbing desertification. Víctor Samuel Rahaovalahy, one of the leaders of the reserve run by the Anja Miray association, told IPS that they were still looking for ways to generate more income and more effective methods to adapt to climate change. “We need more capacity-building, not only for my community, but for surrounding ones as well,” Rahaovalahy said. “We all have to come together to fight desertification in a coordinated manner,” he added, saying the local communities and governments must work together more closely in order to get results. Not all of the participants were clear on how to tackle negative developments in their territories or how to confront big challenges like the effects of climate change. For over a decade, the Sami people in northern Sweden have faced unusually severe winters due to climate change. But they have not yet come together to confront the sudden changes in the climate in an organised way, despite their traditional knowledge, biologist Berit Inga, a Sami descendant, told IPS. Inga said the Sami were more concerned about dealing with more immediate challenges, such as the activities of the mining industry. But everyone at the conference agreed that it was not possible to come up with solutions in an isolated fashion. The manager of the Equator Initiative, Eileen de Ravin, told IPS that successful local experiences should be taken up by governments in the design of public policies that recognise and value indigenous and community knowledge. In the last decade, 152 of the roughly 2,500 nominated indigenous and local community projects won the Equator Initiative prize. The representatives of the winning organisations met at the conference Wednesday to discuss WIN’s future plans.